Is the Port of Oakland About to Privatize Another Terminal? 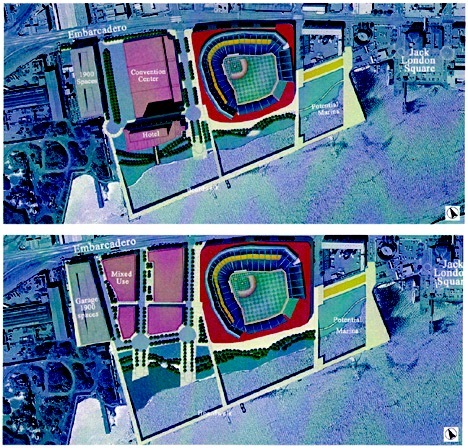 It’s rumored that the Port of Oakland might be close to striking a deal with one of the Port’s tenants, SSA Terminals, to free up land for construction of a new ballpark for the Athletics baseball club. People are calling this reasonable, exciting, and a good idea, mostly because it would build a mirror image of San Francisco’s Giants stadium across the Bay. It’s an item of unquestioned faith among many that a new stadium would be good for Oakland and serve as an anchor around which retail and restaurants will flourish. That’s a strange bit of of faith. Oakland has a long and painful history when it comes to striking deals for its sports teams. Oakland also has a mixed history with respect to the schemes of downtown real estate investors. The addition of SSA into the mix, and the context in which the city, Port, marine terminal operator, and baseball club seem to be dealing is even more reason to worry. SSA is a dominant presence at the Port. The company operates the Oakland International Container Terminal which encompasses Berths 57-59. SSA also operates the Howard Terminal, berths 67 and 68, located just west of Jack London Square in downtown Oakland, but this property is much less valuable than the OICT. SSA’s lease for the Howard Terminal was struck in 2004 and extends until 2021. In March of 2009 the Port of Oakland entered into a privatization contract with Ports America. Backed by a powerful and politically connected private equity group called Highstar Capital, Ports America was allowed to obtain a 50-year concession to control Berths 20-26, known as the Outer Harbor Terminal. This lucrative contract allows Ports America to invest in capital infrastructure and keep a much higher percentage of revenues. SSA filed a lawsuit in December of 2009 against the Port alleging that the Port violated the U.S. Shipping Act by handing its competitor Ports America a much more favorable contract. The Port has attempted to fight this lawsuit before an administrative judge in the Federal Maritime Commission courts. So far SSA’s arguments have prevailed, and it appears that the Port may very well lose the entire case if it moves to trial. The shipping industry is much less competitive than even some of the biggest, most integrated sectors of the economy. U.S. Ports are mostly run by municipalities or the states, and because the industry is dominated by a few monopolistic alliances of shipping companies and terminal operators under “alliances,” the federal government has long pressured both corporations and public port authorities to play by very strict rules. An overarching goal of the rules is that public port authorities must extend more or less the same contract terms to all terminal operators and shipping companies, favoring none over the others. Oakland may have violated this law when it privatized the Outer Harbor Terminal through the lucrative concession agreement with Ports America. So if the Port likely stands to lose its case against SSA, perhaps a settlement deal that would hand the Howard Terminal property over to the Port, in exchange for the Port giving SSA a concession deal like Ports America is in everyone’s interest? It’s the Howard Terminal where Oakland’s baseball boosters want to build the new ballpark, so the trade being proposed in closed sessions of the Port Commission seems to be that SSA will drop the lawsuit if Oakland gives them a concession contract for Berths 57-59, and to sweeten the deal for Oakland SSA will hand over Howard Terminal. There’s a few problems with this deal, if it is in fact what is being proposed. First, SSA’s Howard Terminal has not been the subject of SSA’s lawsuit against the Port. SSA has instead contested the terms of its lease of Berths 57-59, comparing this terminal lease with that of Ports Americas’. Bringing the Howard Terminal into the dispute is dubious as it has nothing to do with SSA’s contention that it has been unfairly treated by the Port. Whether or not SSA wants to make a deal to hand over the Howard Terminal to Oakland is a separate issue from the lawsuit over the concession agreement the Port inked with Ports America, and which SSA claims is undermining their business at Berths 57-59. There may be further problems with the Port making any deals with SSA. Last year the Oakland City Council directed the city and all its departments to no longer conduct new business with Goldman Sachs. Goldman Sachs owns a 49 percent stake in Carrix, the corporate parent of SSA, thus any new deal with SSA would indirectly constitute a deal with Goldman Sachs. Handing SSA a concession agreement like Ports Americas would be the equivalent of the Port of Oakland, a department of the city, handing millions over to Goldman Sachs. And what will become of the Oakland Coliseum if the A’s move and the Raiders don’t stay? How will the debt on the Coliseum be paid down? Will the new stadium even be financially viable? Who will finance it? Sports boosters in Oakland surely have panglossian answers to these questions, but history is against them. Oakland’s sports franchises have cost the city hundreds of millions and never provided the kind of economic return to make professional sports a worthwhile target of government subsidy. In fact that’s what San Francisco’s voters concluded years ago when the rejected several proposed bonds to subsidize AT&T Park and forced the Giants owners to put up more of their own money for the stadium. Finally it’s clear that 50-year concession agreements to effectively privatize port facilities, while providing for some stability in terms of the Port’s tenancy, and some handsome cash payments upfront, also take control away from the Port Authority with respect to land use, capital investment, and other crucial decisions. Furthermore, concessions agreements are very popular with companies like SSA and Ports America precisely because of what SSA alleges in their lawsuit against the Port: concessions financially favor private corporations, reduce competition between government contractors, and allow them to extract bigger profits from public infrastructure. Under a concessions agreement the port is left with fewer dollars to pursue its mission of regional economic development, job creation, and stewardship of public maritime resources. Control over the port infrastructure is completely removed from any semblance of democratic decision making, and placed into the hands of investment bankers and corporate executives. Google operates its own system of private buses. The coaches zip up and down the San Francisco Peninsula five days a week. Rebecca Solnit describes the tech company buses (other corporations like Apple and Genentech run them too) as “spaceships on which our alien overlords have landed to rule over us.” The buses facilitate the colonization of San Francisco’s hip neighborhoods like the Mission by youthful idiot savants with six figure paychecks and no scruples about paying three thousand a month in rent. George Packard calls the buses a “vivid emblem of the tech boom’s stratifying effect in the Bay Area.” The buses are sorting mechanisms. They’re helping re-organize the Bay Area geographically, residentially, racially, between the tech industry’s uber-haves, and the rest who have not the luck to be employed by a company with its own fleet plush, air-conditioned, wi-fi shuttles. But Google also has a fleet of airplanes. And if the buses are emblems of the tech boom’s stratification of the California Bay Area, the planes are probably signifying something on a more planetary scale. 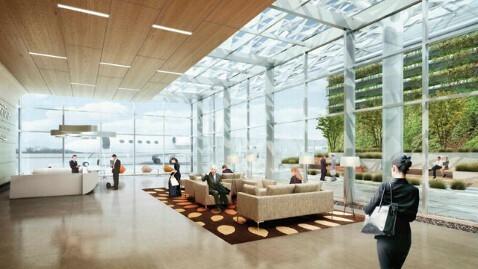 Artist’s rendering of the interior of Google’s future airport. Last month Google’s top three billionaires, Sergey Brin, Larry Page, and Eric Schmidt, effectively bought a portion of the San Jose Airport to hangar their jets. Google’s privatized airport will host at least 8 aircraft owned by the three Google executives, including a customized Boeing 767. The airport will also host planes for other tech elite of Silicon Valley. Oracle Corporation CEO Larry Ellison is famous for his squadron of private jets and hobby planes at the San Carlos Airport further up the peninsula toward San Francisco. Ellison, however, doesn’t own the airport. The privatization deal with Google’s executives is a first. Only a few airports in U.S. history have been privatized. The public face of the privatization deal to purchase a huge chunk of San Jose’s airport is Signature Flight Support. Signature is owned by BBA Aviation, a British company that specializes in building and operating exclusive airports for the global elite. As the company’s web site explains, Signature is “focused on regions with high business jet populations.” Regions with high business jet populations are synonymous with regions having large concentrations of the one percent, the uppermost income earners and wealth holders of the new economy. In the Bay Area resides at least 50 billionaires. Overhead view of the portions of the San Jose International Airport that will be privatized and developed by Google and its airport developer Signature. 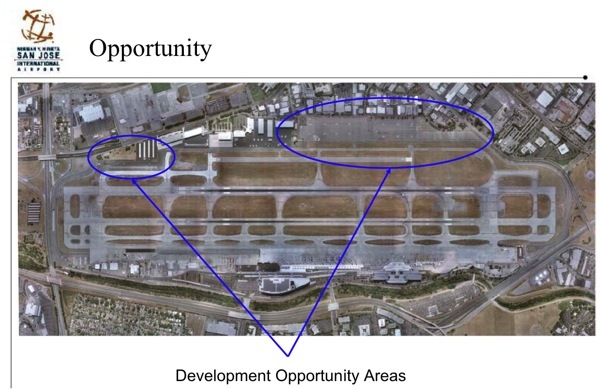 Source: “Mineta San Jose International Airport West Side Development Draft RFP,” City of San Jose, July 12, 2012. “The business that is available” is a round about way of saying that there’s probably now more than a few young billionaire and millionaire types in Silicon Valley who just aren’t content owning their own airplane, or even private fleet of jets, but who have so much money they want their own airport too. Privatized transportation infrastructures, from bus systems to airports now, seem to be the rage among California’s Internet tycoons. Blue City Holdings San Jose LLC is the special holding corporation the boys from Google set up apparently to take over part of the San Jose Airport. Blue City Holdings LLC is a separate holding corporation established, it appears, to manage the airplane assets owned by Brin, Page, and Schmidt, for tax purposes mostly. The lawyer administering BCH San Jose LLC for Google’s billionaires specializes in the financing and tax structure of aircraft ownership for the wealthy, according to his law firm’s web site. Aircraft are tax deductible business expenses thanks very much to years of lobbying by corporate executives. Under the U.S. tax code there is a pretty generous depreciation schedule that can knock significant sums ofr a person or company’s tax bill. The corporate lawyer for Blue City Holdings is Teling Peterson, the CEO of Hillspire, LLC, a boutique wealth management company that manages over a billion in assets for a few high net worth families. Peterson apparently manages part of Eric Schmidt’s fortune. She also sits on the board of the Ocean Institute Schmidt created and named after himself. Google doesn’t seem to have plans to privatize a sea port anytime soon to accommodate its wealthy executives’ ocean hobbies, as far as we can tell. The airport deal, however, does mean that a significant piece of San Jose’s transportation infrastructure will be dedicated completely to serving the upper-most fraction of the region’s one percenters for the next fifty years. A business case study conducted for San Jose to determine what use to put the Airport’s “West Side Property” several years ago noted that under its use back then, mostly as a general aviation facility, the parcel was already serving a mere one percent of the passengers that the San Jose commercial airport’s air carriers were transporting on a yearly basis. Now as a fully private airport for Google and a few other of the Silicon Valley nobility, the facility will likely serve the needs of far less than even the symbolic one percent, surely an emblem of the region, and the planet’s growing inequality.